Apparently, one of those piles was near where the plaintiff parked. When the plaintiff was returning to his car after shopping, he tripped on a chunk of ice near the base of a pile. The plaintiff filed a premises liability lawsuit, claiming that the store was liable for his injuries. At the time, Massachusetts law drew a distinction between natural and unnatural accumulations of snow and ice, and a landowner could only be held liable for unnatural accumulations that were the result of their own actions. Thus, the court dismissed the plaintiff’s case on the basis that the chunk of snow was a natural accumulation. The plaintiff appealed. On appeal, the Supreme Judicial Court of Massachusetts did not bother with determining whether the chunk of ice was natural or unnatural, and instead abolished the distinction between the two. The court explained that the natural-unnatural distinction was a unique aspect of Massachusetts premises liability law that did not comport with the duty of landowners in other contexts, which merely required the landowner keep their property in a “reasonably safe condition.” The court explained that the distinction injected an element of subjectivity and confusion into the analysis, and that courts and jurors are more easily able to decide these cases without the distinction. Thus, the court remanded the plaintiff’s case to be considered under the new version of the law. 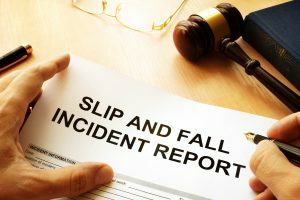 Have You Been Injured in a Massachusetts Slip-and-Fall Accident? If you or a loved one has recently been injured in a Massachusetts slip-and-fall accident, you may be entitled to monetary compensation. The dedicated Massachusetts personal injury lawyers at the Neumann Law Group have decades of combined experience assisting injury victims and their family members in pursuit of claims for compensation arising out of all types of Massachusetts accidents, including slip-and-fall accidents. To learn more, call 617-918-7790 to schedule a free consultation today. Massachusetts Appellate Court Considers Judge’s Reduction of $32 Million Jury Award, Massachusetts Injury Lawyer Blog, December 21, 2018. Comparative Negligence in Massachusetts Car Accident Cases, Massachusetts Injury Lawyer Blog, December 5, 2018.